This was all announced back at VMworld US in August. If you were there you saw the keynote from Guido on Cross Cloud Services during the Monday Morning General Session. So let me give you a short break down on my personal perspective of what VMware Cross Cloud Services is and also maybe address some of the confusion even I have had with all the recent cloud related announcements. This image is taking from the article link above. I’ll try to explain how I see this coming together and you can imagine where that fits in. VMware Cross Cloud Architecture as shown, is the umbrella under which various things reside. Cross Cloud Services being one of those as you can see. 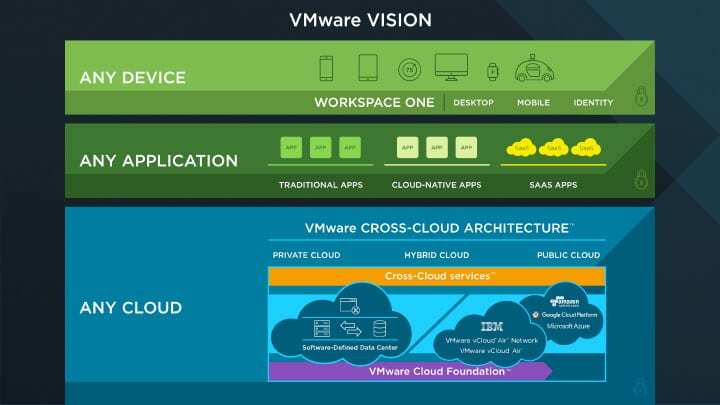 There are a couple components we can take away from this graphic that make up the VMware Cross Cloud Architecture. From my perspective, VMware Cloud Foundation is a platform, made up of the various SDDC components. This part of the VMware Cross Cloud Architecture has been much more visible in recent months due to both the IBM and AWS announcements for sure. Okay then so what the heck is VMware Cross Cloud Services? Good Question and to be honest there is not much out there if you google it, so I am going to give you a little insight. VMware Cross Cloud Services is a grouping of services to better manage the various cloud deployments you have. It’s much more than a single pane of glass based on what you saw in the keynote video. Initially, the goal is to discover the workloads you have out there. Understand what is running, how much it’s costing, and where the best place to maybe place new workloads. Fundamentally before you can manage your clouds you need to discover what’s out there. This is not only public cloud discovery but private cloud as well. That’s a big part of Cross Cloud Services. Secondly, once we know what we have out there, we probably want to start doing a better job connecting these clouds and their networking. This has been a goal for some time that many of us want. Having multiple clouds is great, but connecting them has been a huge challenge. I’ve done it successfully with vCloud Air in the past using VPN’s and other means. It can be done, but there needs to be a more seamless approach. We also saw in the video some network examination of traffic as well to ensure things are flowing how we expect and want them to. Third, once we know what we have, where it’s running, how much it’s costing, and we’ve connected it all we may want to look at moving workloads around. Migration between clouds has been done by tools like vCloud Connector and companies such as River Meadow. These are just the examples of what we saw in the keynote video. The real message here is that all this is alongside the VMware Cloud on AWS, and VMware Cloud Foundation announcements. This is all part of the VMware Cloud Architecture and I am excited about working with the VMware Cross Cloud Services specifically in the coming months. Hopefully this makes the mud a little more clear on what exactly VMware Cross Cloud Services is. Certainly leave any comments or questions below!